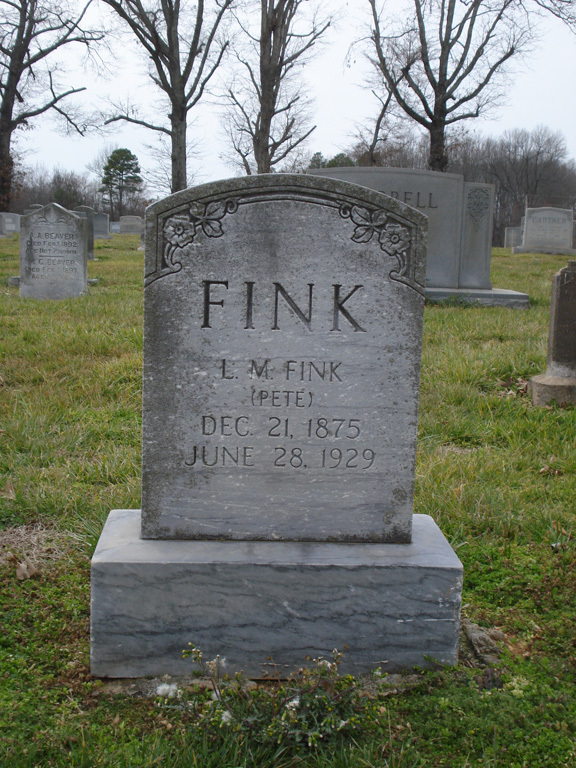 Lucas Monroe Fink was the 4th child born to David Alexander Fink (1832) and Margaret Elizabeth Baker. He was born 21 Dec 1875. In 1880, David and Margaret Fink were living in the Scotch Irish Township of Rowan County, NC. Lucas' age is listed as 4 years old. 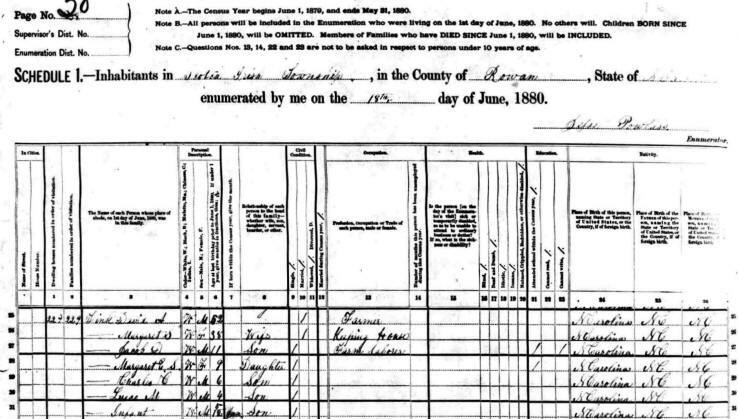 The 1900 Rowan County Census shows that only four of David & Margaret's children were still living on the family farm. Lucas' names is misspelled as "Lueco M." and he was listed as 28 years old, but he was actually only 25 years old. His birth year was incorrectly listed as 1871. Lucas married Rebecca Elizabeth Williams. Elizabeth (as she was called by family & friends) was born around 1892. Lucas was 38 and Elizabeth was 22 at the time of their marriage. The 1920 Rowan County Census indicates that Lucas and Elizabeth were living in the Scotch Irish Township of Rowan County, NC. This census indicates that Lucas was 16 years older than Elizabeth and lists his age as 44. His occupation was listed as "farmer". They had one child - Arthur Burns Fink, who was 4 years old. 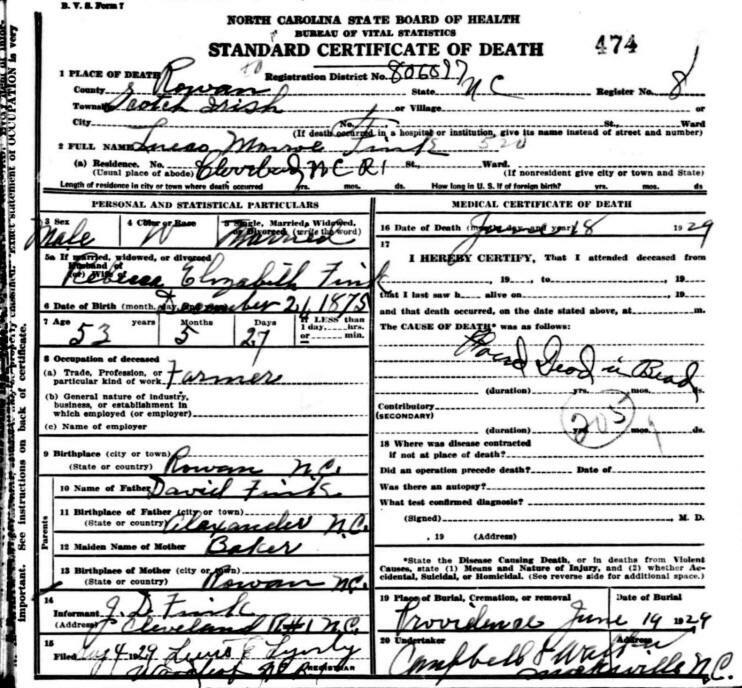 Lucas Monroe Fink died 18 Jun 1929 in Scotch Irish Township, Cleveland, Rowan County, NC, at the age of 53. He was "found dead in bed" by his brother J. D. Fink. Lucas was buried at Old Providence Presbyterian Church Cemetery in Cleveland, Rowan County, NC. In 1930, Lucas Monroe Fink's wife Elizabeth (listed here as Lizzie B. ), was living with her son Arthur Burns Fink, her cousin Viola Williams, her brother and sister-in-law Jasper and Nettie Williams. Lucas' siblings, John David, Margaret Elizabeth (Bettie) and Ellen Katherine Fink were living near by.